Spells can only be used by Heroes who possess a Primary Skill Card that specifically allows that spell to be used. 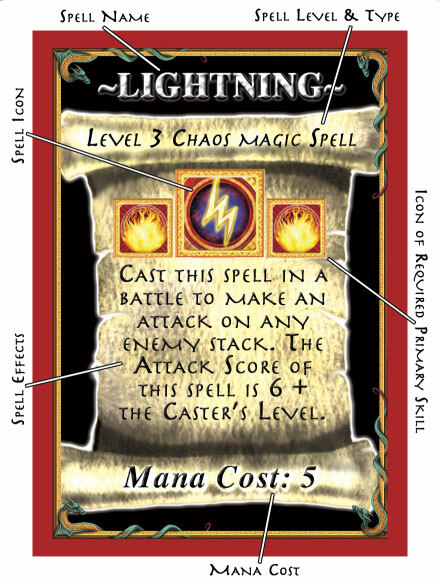 The Primary Skill Card shown above for instance, allows a Hero to use Level 1 Chaos Magic Spells when it is Basic, and Level 2 Chaos Magic Spells when they have progressed to Advanced Chaos Magic. The Spell Card shown below is a Level 3 Chaos Magic Spell, and therefore cannot be used until the Hero advances to a higher level of Chaos Magic Skill (Expert, to be precise). Cards and stacks of cards don’t fit in the hexes found on the map sections. So we use markers to represent them on the board. You will notice that there are 2 markers of each type with the same number. One of them is light and the other is dark. By placing one of them on the card (or stack of cards), and the matching one on the map, we can know the location of the card (or stack of cards). You may use the light or the dark marker for the card or for the map, as long as the two markers have matching colors and numbers.